Your Downtown Dentistry has been serving Orlando’s greater area for a considerable amount of time now. Our dental practice is state of the art in that it is fully equipped with cutting edge technology. Not only that, but everyone you meet, from the very first person who greets you to your dentist, will treat you with the utmost care and kindness. Our mission is to provide restorative dentistry and preventative dentistry services for those young and old. In this two-part series, we would like to outline our extensive range of dental services that we offer the Orlando area, so that you can find exactly what you are looking for. Our family dentist care services can be broken down into the following areas: preventative dentistry, restorative dentistry, cosmetic dentistry, botox, and dental implants. In today’s post, we will cover our preventative and restorative dentistry services. Prevention – Dr. Ali Behzadi, DMD, maintains that prevention is key, especially when it comes to teeth care. While your smile can always be improved with professional teeth whitening and cosmetic dentistry, an ounce of prevention is worth a pound of cure, as the old saying goes! Dental Cleanings – Our priority is to ensure that your routine dental cleanings are as thorough as they are gentle. We have the capability to assess your risk of tooth decay, infection, and even disease. Our doctors recommend having a dental hygiene cleaning at least twice per year. Proper Occlusion – The process of your teeth coming together during the biting process is termed “occlusion.” Having poor occlusion can result in an overbite or underbite, not to mention loose teeth or waking up with a sore jaw. To combat poor occlusion, we offer Invisalign, dental implants, crowns, and more in order to either correct or prevent occlusion. Uncompromising Quality Materials – As part of our commitment to keep our clients safe, secure, and smiling brightly, we can assure you that we will never include anything remotely dangerous or toxic during our dental care sessions. We will never compromise our values which all point back to giving you the best preventative dental care in the Orlando, FL area! Metal-free Fillings – We are proud to exclusively offer metal-free fillings, as part of our commitment to keep you safe. You see, in more antiquated metal-fillings, one could find mercury, which is of course toxic. Our composite materials are a modern and safe alternative for restorative tooth decay. Among the many advantages of using metal-free fillings is that they will never weaken your teeth. Others include long-lasting results, bacteria being sealed out, a natural appearance, effective bonding, and no contraction or expansion with temperature change. Crowns and Bridges – We restore your smile with care and precision. Inlays and Onlays – Enhance the structure of your dental makeup while sealing out bacteria at the same time. Protect your teeth and get your beautiful smile back at the same time! 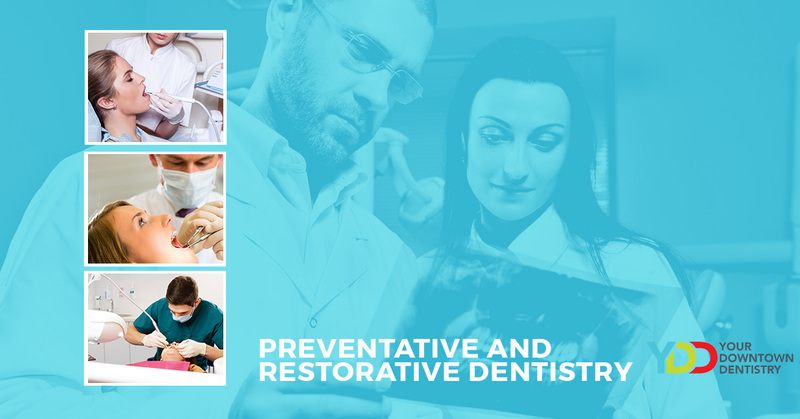 As vital as restorative dentistry can be to your smile and oral health in general, Your Downtown Dentistry believes wholeheartedly that prevention is key. In part 2 of our services series, we will look at our dentistry services which include cosmetic dentistry, botox, and dental implants!